Dumaguete City is the capital and most populous city of Negros Oriental, Philippines. Due to its shy and friendly populace, it is often called the “City of Gentle People.” But when we visited there a few weeks ago, we suddenly realized it’s more than that. 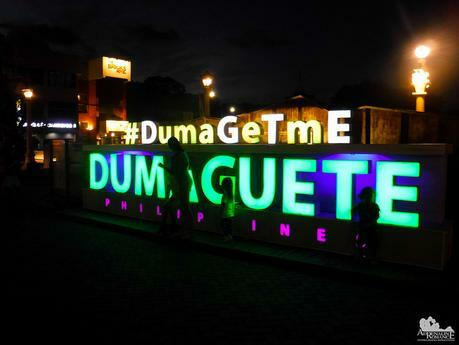 Dumaguete actually wears a few other well-deserved names! Due to a slow bus, a long lunch break, a slow barge, and lots of stops, we arrived in Dumaguete at 1 PM, two hours late from our scheduled arrival. Tired after a long bus trip, the girls took an afternoon nap while I took the time to visit Fred’s Ultimate Hobby Shop. After buying a couple of model kits, paints, and tool, I headed back to the hotel and joined the girls for some quick shut-eye. 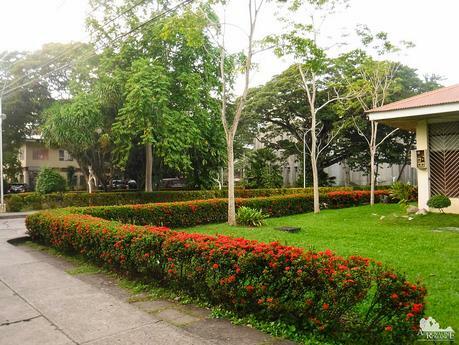 Silliman University, which covers a sprawling total land area of 62 hectares, is the premier university in the city. Its size, location, number of higher-learning courses, and top quality of education has made it the “center of learning in the south.” Dumaguete’s university city culture actually centers on Silliman University, a melting pot of students, artists, scholars, professionals, and literati. Alexa, who loves academics, was so love-struck by the university that she asked us if she could study here when she goes to college. It’s not difficult to see why she felt this way. With lots of trees, flowers, and quiet spaces, it’s really a pleasure to study here. Silliman University was established in 1901 by the Presbyterian Board of Foreign Missions, starting out as an elementary school for boys. In 1938, it acquired university status. The university was initially operated by Americans, but after World War 2, Filipinos assumed positions in the administration. In 1952, a Filipino was appointed as the university’s president. Due to the university’s rich history and great impact in the Philippines in terms of education, Silliman University was registered as a National Landmark by the National Historical Institute. Indeed, several of its edifices have been recognized as landmarks. 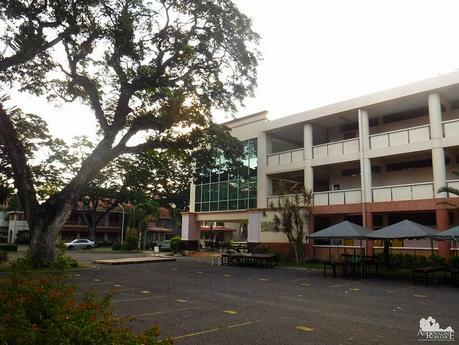 Such buildings include the James Chapman Science Complex, Hibbard Hall, Katipunan Hall, and Silliman Hall. The university also houses the Silliman Main Library, considered to be one of the largest libraries in the country. The campus also has various museums, research centers, gymnasiums, dormitories, and even its own beach! Today, Silliman University is composed of 10 colleges, 5 schools, and 3 institutes, providing education for more than 9,600 students all over the Philippines and the world. It offers a lot of courses; in fact, it has the highest number of accredited programs in the country. 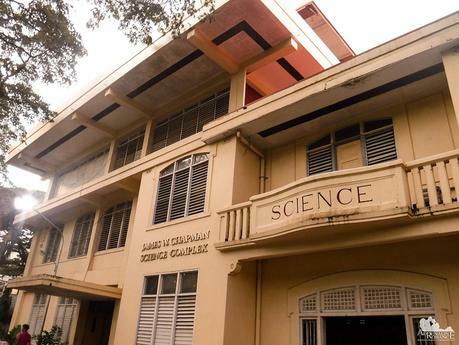 Silliman University is also involved in environmental and marine sciences. Its involvement in such endeavors made it a Center of Excellence in Coastal Resource Management as stipulated by USAID. Is this a modern interpretation of Rome’s Colosseum? Nope! 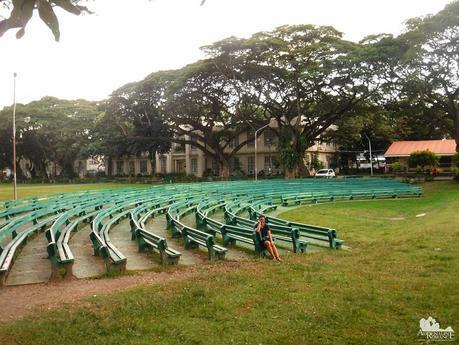 This is the expansive outdoor amphitheater of Silliman where school events are usually held. Serene, quiet, and relaxing, it is a meeting place for students. 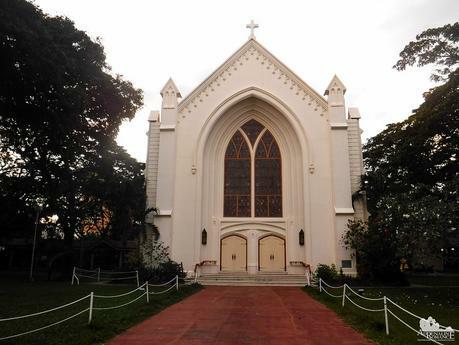 The Silliman University Church stands as a beacon of spiritual renewal. Construction began in 1941, but due to World War 2, work was constantly interrupted. It was completed 8 years later in 1949. The church is famous for its beautiful stained glass windows. Unfortunately, it was closed when we visited there. 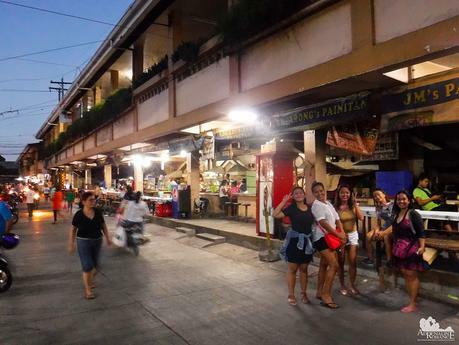 One of the things that visitors notice when they first visit Dumaguete is an unusually large number of foreigners. When we pointed that out to our friend and fellow blogger Ferna of Everywhere With Ferna when we met her the next day after our amazing day at the stunning Manjuyod Sandbar, she explained that foreigners easily fall in love with Dumaguete’s laid-back atmosphere, rich culture, and affordability. 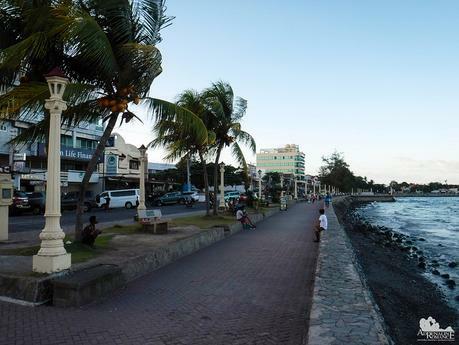 And there’s no other place in the Dumaguete that exemplifies this aspect of the city than the historic Rizal Boulevard. 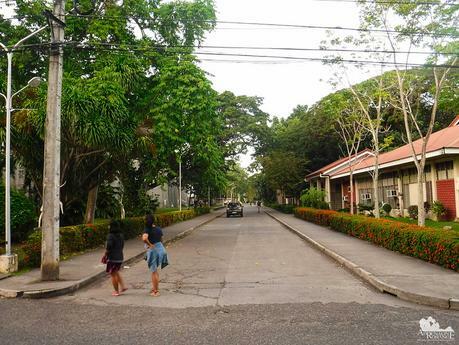 It’s a long lovely tree-lined esplanade that faces the southern tip of Tañon Strait. It’s a great place for locals and tourists to hang out. Just across the Boulevard are hotels, cafes, bars, and fine-dining restaurants, all of which offer beautiful views of the sea. 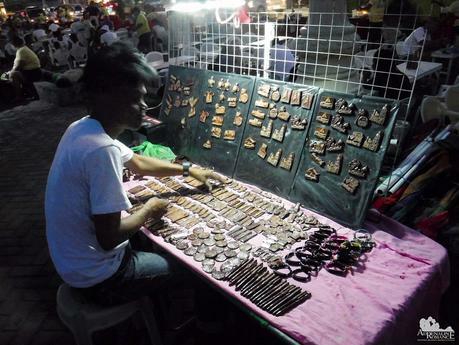 Talented local artists and craftsmen compete for space with food vendors at the Boulevard. We bought a few keychains and ref magnets as souvenirs. 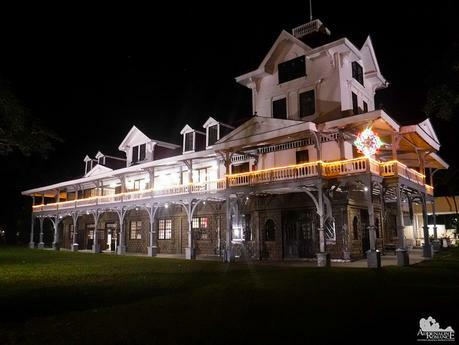 Near the northern end of Rizal Boulevard is the Silliman Hall, the oldest standing American structure in the country. If you notice, it has a characteristic Stick-type architecture that is common in American buildings during the late 19th century. We were familiar with the architecture because we’ve visited a similar albeit smaller structure that exhibits the same kind of architecture—the Bell House at Camp John Hay in Baguio. Silliman Hall is now the university’s Anthropology Museum. Unfortunately, we didn’t beat the closing time when we arrived there. 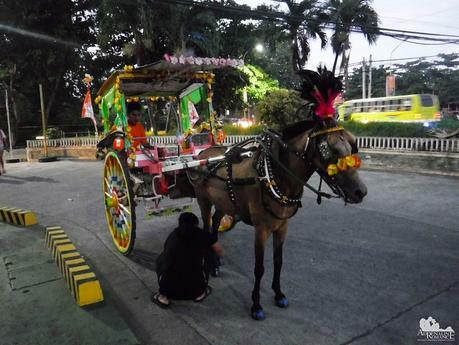 Sometimes, you might come across a calesa, a horse-drawn carriage that dates back to the Spanish times. Ferna gave us a tour of her beloved city. 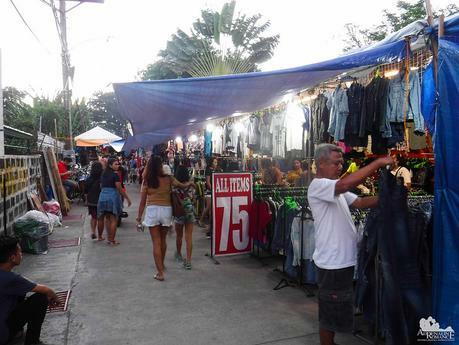 Knowing how much we eye for bargains, she took us to a bazaar that offers ridiculously low-priced items. If you have a shopping addiction, you’ll probably love it here! 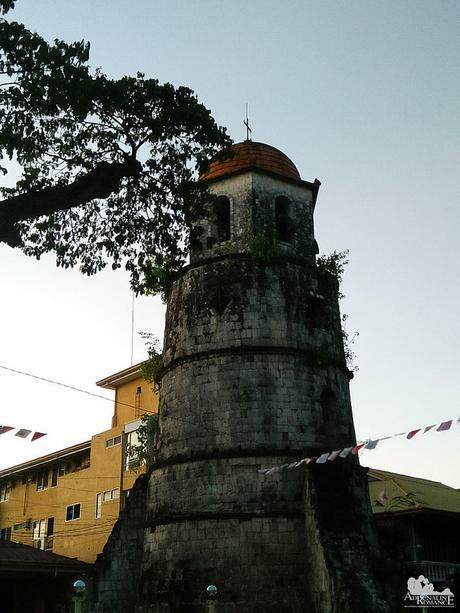 Another popular landmark is the Dumaguete Belfry, one of the oldest surviving structures in the city. Originally, it was a watchtower where the local law enforcement would keep a lookout for pirates. Once the marauders are sighted, the watchers would ring a bell to warn residents of the threat. In that way, residents can buy time to retreat to safer places, barricade themselves, or take up arms. 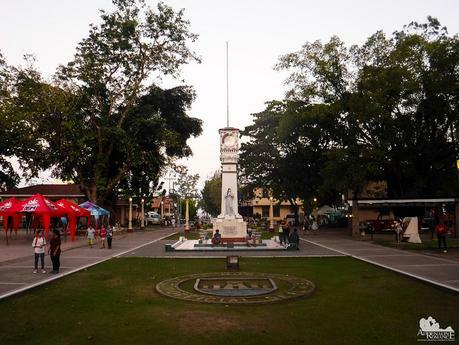 The Manuel L. Quezon Plaza is a favorite hangout for locals. The park has a lot of benches, grassy areas, gazebos, and playgrounds. Many of the city’s festivals, concerts, and special events are held here. 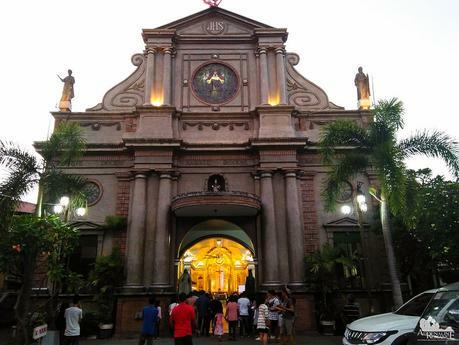 Across the Quezon plaza is the St. Catherine of Alexandria Cathedral, one of the most beautiful cathedrals we’ve ever seen. It was constructed in 1754 and finished 22 years later. After surviving raider attacks, battles, natural disasters, and degradation, the cathedral was reconstructed in 1885 with an annex added in 1936. The Cathedral’s most prominent features are the four towering stone pillars at the entrance. On top of these pillars stand intricate statues of four of the Apostles—Sts. Matthew, John, Luke, and Mark. Dumaguete’s gastronomic delights can satisfy even the most demanding food critics, foodies, and connoisseur. But what is even more amazing are the incredibly low prices. If we lived here and we’re earning as much as we’re earning now, we would probably become overweight in a few months’ time! It comes to no surprise though. As mentioned earlier, Dumaguete is a university town, which meant that a major part of its spending population consists of cash-strapped students. Thus, even the most high-end restaurants serve fine-dining quality food at prices that are delightfully affordable. No wonder too why there are a lot of expats living in the city; its affordability and serenity makes it an awesome place to stay. 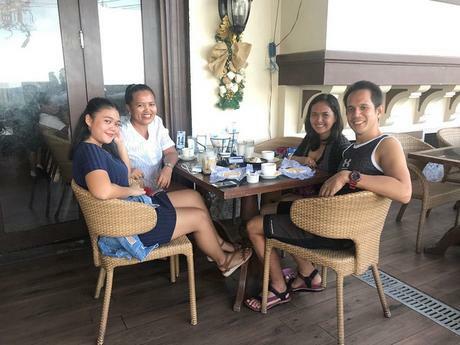 We met Ferna at Sans Rival Cakes and Pastries, one of the most famous bistros in the city, just right across the Rizal Boulevard. The bistro is famous for its namesake pastry. Sans rival is unique to the bistro and has become a Filipino culinary pride. 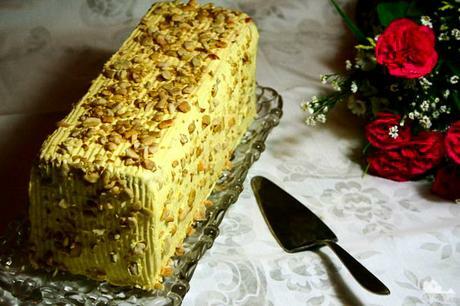 The dessert cake consists of layers of buttercream, meringue, and chopped cashews. For us, it beats the best cakes by a mile. In fact, its name literally means “without rival” in French! The other pastry that they specialize in is the Silvana, another legendary dessert they made. Basically, it is a cookie version of Sans Rival, with sweet buttercream spread between meringue wafers. The difference is that the cookie is frozen before it served. Ice cream? I’d go for silvanas! Knowing we were breakfast people, Ferna also led to a line of humble eateries at the city’s wet market. Dubbed Painitan, this place is a popular place for early risers. Indulge yourself in freshly prepared traditional Filipino breakfasts such as puto (sticky rice), sikwate (hot cocoa), fresh mangoes, and more. 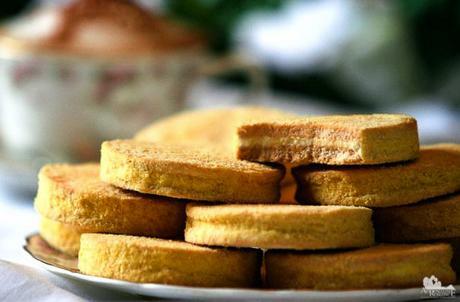 Ferna said that many foreigners frequent the place due to the affordable yet delicious morning energizers. Even local late risers can’t resist the fresh budbud paired with sikwate. Just imagine: you wake up at dawn, jog from your place to Rizal Avenue, watch the blazing sunrise, then head off to the Painitan to have breakfast! What a way to start your day! Purple eggs? Those are called itlog maalat (salted eggs). Fresh chicken or duck eggs are submerged into an incredibly strong brine solution for a few weeks. The brine penetrates the shell and makes the insides salty. The salted eggs are then taken out of the brine and boiled. 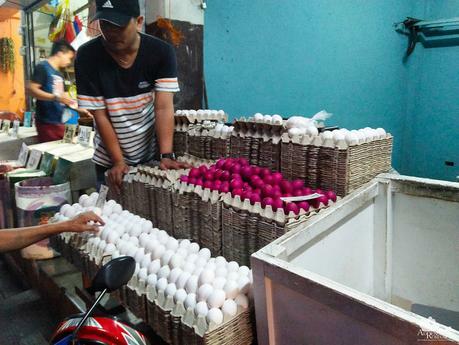 To differentiate them from the normal eggs, the itlog maalat are dyed purple. Itlog maalat is one of our favorite side dishes. At home, we usually mix them with chunks of hard-boiled eggs, tomatoes, and onions then sprinkled with a bit of salt and pepper. Ferna and her sister had to go somewhere, so we said our goodbyes and headed back to Rizal Boulevard. With multicolored glittering lights amidst a purple glow in the sky, the place really comes alive at dusk and early evening. When the sun goes down, hawkers set up portable stalls, seats, and chairs along one side of the Boulevard. 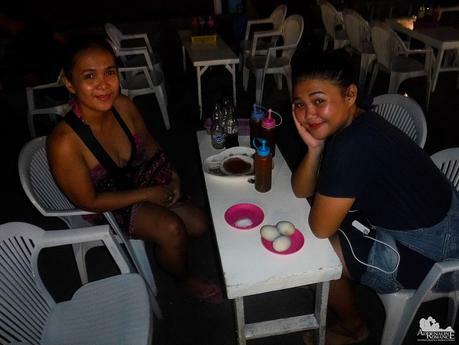 They sell various delicious street food such as tempura, fish balls, squid rolls, and—the king of all Filipino streetfood—balut! The girls and I had our pre-dinner here. 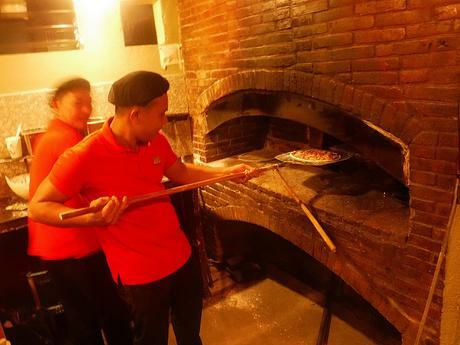 For dinner, we went to Neva’s Pizza, a popular resto whose specialty is serving delicious, chunky pizza that is freshly baked in stone ovens. Wood and charcoal are used as fuel for the oven. 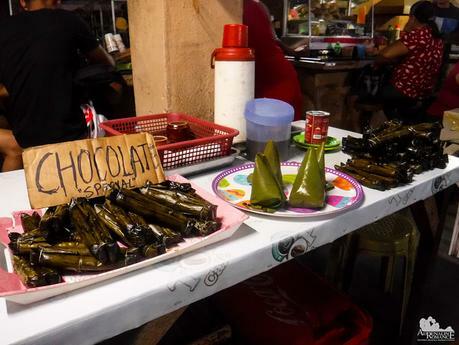 Like many of the food establishments in Dumaguete, their food preparation is done in very traditional ways. And yes, their pizzas are just awesome! Too bad we only had a two and a half days to spend in Dumaguete. But the city—with all its rich culture, laid-back atmosphere, affordable and delicious food, and friendly people—really captured our hearts. The conducive surroundings for learning left Alexa smitten. 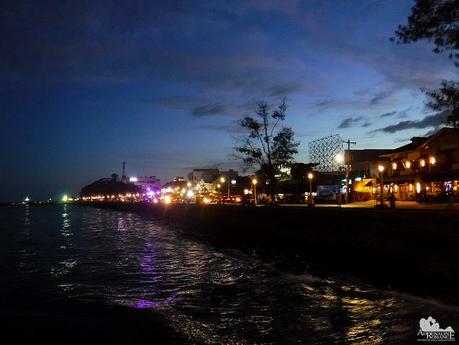 It’s not really difficult why Dumaguete is hailed as one of the “7 Best Places to Retire Around the World” as per Forbes Magazine; that’s another prestigious name to add. We will definitely be back in Dumaguete this year for our upcoming dives in Apo Island, hikes in nearby Twin Lakes, and climbs around nearby mountains. And it’s a no-brainer that we’ll fall in love with the city again.